The Published Admissions Number (PAN) for Reception in September 2019 is 30. Applications are invited for September 2019 from families whose children were born 01/09/2014 and 31/08/2015. Applicants may defer entry to school up until statutory school age i.e. the first day of term following the child’s fifth birthday. Application is made in the usual way and then the deferment is requested. The place will then be held until the first day of the spring or summer term. Applicants may also request that their child attend part-time until statutory school age is reached. Entry may not be deferred beyond statutory school age or beyond the year of application. Applicants whose children have birthdays in the summer term should be aware that, if they wish to defer, they will need to apply for a Year 1 place for the following September and if the school is oversubscribed they are very unlikely to obtain a place. Parents will be required to complete the Common Application Form (CAF) from their local authority. The CAF will also be available from any Primary School or the Admissions Team, London Borough of Hillingdon, 4E/09 Civic Centre, High Street, Uxbridge, UB8 1UW from the beginning of the Autumn Term. To be treated as 'on time' the CAF must be emailed or returned to the local authority, with documenting evidence of address and child's date of birth, by 15th January 2019. Parents living outside of the Hillingdon Borough must complete a CAF form for their Borough of residence and return it to the address on the CAF. Parents may express up to six preferences for primary schools on the CAF. In addition to the CAF supplied by the LA, the Supplementary Information and Certificate of Cathollic Practice, should be completed and sent to the School Secretary by 15th January 2019. You should complete the supplementary form in order that the Governors can consider the application fully. The Supplementary Information Form (SIF) is obtainable from the school and the SIF is also obtainable from the LA offices and website and from the school website (to be confirmed). You can collect the forms from the school or contact the school and ask for them to be sent to you. Offers of places will be sent to parents on the national offer date of 18th April 2019. Catholic looked after children (as defined in the Children Act 1989) or a child who was previously looked after but immediately after being looked after became subject to an adoption, child arrangement, or special guardianship order. Baptised Catholic children from families resident in the outlined boundary of St Catherine’s Parish, fully supported by a Certificate of Catholic Practice. Baptismal certificate required if not of St. Catherine’s Parish. Baptised Catholic children from any Catholic Parish who are supported by a Certificate of Catholic Practice and provide a Baptismal certificate. Baptised Catholic children from families resident in any Catholic Parish who provides a Baptismal certificate. Other looked after children and children who have been adopted (or made subject to child arrangement orders or special guardianship orders) immediately after having been looked after. Other Christian children, whose application is supported by a letter from a minister or faith leader confirming membership of the faith community. Children from other faiths whose application is supported by a letter from a minister or faith leader confirming membership of the faith community. 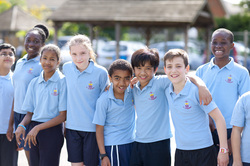 The Governing Body will give top priority after the appropriate category of looked-after children, to an application where compelling evidence is provided at the time of application, from an appropriate professional such as a doctor, priest or social worker, of an exceptional social, medical, pastoral or other need of the child, which can only be met at this school. Children living nearest to the school. Distance will be measured in a straight line from the point set by Ordnance Survey at the child’s home address and the preferred school using a computerised mapping system. ‘Catholic’ is defined as a member of a church in full communion with the See of Rome. This includes the Eastern Catholic Churches. This will normally be evidenced for a child by a certificate of baptism in a Catholic church or a certificate of reception into the full communion of the Catholic Church. Any late applications, that is, those submitted after the published closing date in the ‘Starting Primary School’ brochure 2018/19, will be considered by the Governors’ Admissions Committee, in the event of there being any available places, using the above criteria. If all places have been filled, parents will be offered the opportunity of placing their child’s name on the waiting list. This does not prevent parents from exercising their right to appeal against the decision not to offer a place. Applications for In-Year admissions are made directly to the school. If a place is available and there is no waiting list, the Common Application Form and the Supplementary Information Form will be completed and the child will be admitted. If more applications are received than there are places available then applications will be ranked by the governing body in accordance with the oversubscription criteria. If a place cannot be offered at this time then you may ask us for the reasons and you will be informed of your right to appeal. You will be offered the opportunity of being placed on a waiting list. This waiting list will be maintained by the governing body in the order of the oversubscription criteria and not in the order in which the applications are received. Names are removed from the list at the end of each academic year. When a place becomes available the governing body will decide who is at the top of the list and an offer will be made. Sibling is defined as brothers and sisters, step brothers and sisters, half brothers and sisters or adopted brothers and sisters living at the same address. This priority does not include brothers or sisters due to transfer to secondary school in the next academic year. Where the final place is offered to a child who has a twin/triplets etc. applying for a place in the same school year, these siblings will also be admitted. ‘Practising Catholic’ means a Catholic child from a practising Catholic family where this practice is verified by a reference from a Catholic Priest in the standard format laid down by the Diocese. Parents of children attending the Nursery school must make a fresh application for the Reception class. A ‘looked-after child’ has the same meaning as in section 22 of the Children Act 1989, and means any child in the care of a local authority or provided with accommodation by them (e.g. children with foster parents). ‘Parent’ should be defined as the person or persons who have legal responsibility for the child. ‘Resident’ – A child is deemed to be resident at a particular address when he/she resides there for 50% or more of the school week. ‘Christian’ is defined as a member of a Church which belongs to ‘Churches Together in Britain and Ireland’.